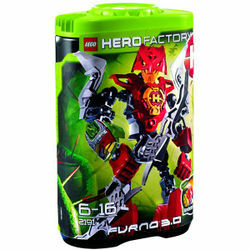 2191 Furno 3.0 is a Hero Factory set that was released in July 2011. The set includes a red Hero, Furno's fourth variant, counting the second 1.0 mode in the Furno Bike set. Furno wields a plasma bow on Savage Planet. The only armour pieces not red in the entire set are the transparent green Savage Planet badge, on his right forearm, and the silver body armour piece beneath his chestplate. He does not have armour on either his upper arms or thighs; instead, connected to his arms, he has wings that allow him to fly for short distances. His shoulders are wider than those of some other Heroes, such as Bulk 3.0, and his helmet resembles the head of a hawk or eagle. William Furno is a recently built Hero that has gained Preston Stormer's full respect. During his creation the maintenance workers noticed something special about him. He is a diehard hero, and has been constantly studied by Nathaniel Zib, due to his unique qualities. He helped stop Von Nebula and his minions and single-handedly took down notorious psychopathic villain Rotor, and helped take down the Fire Lord, Drilldozer, Jetbug, and Nitroblast. Although the set does not have any top leg armour, it seems as if the Furno 3.0 figure in Creep Crushers does wear such. Unlike Furno 2.0, Furno 3.0 includes two hands also. In the Creep Crushers game it shows his bow is silver. It will be the third version of William Furno, aside from the Furno Bike variant. Furno is one of two heroes released to have every variation from 1.0 to 3.0. The other is Stormer. In the set, his wings are upward, but in the cartoon they are on the side. This is a description taken from LEGO.com. Please do not modify it. (visit this item's product page) Rescue planet Quatros from certain destruction! Come in, William Furno! Get to jungle planet Quatros immediately. Witch Doctor is removing the planet’s Quaza core and it’s becoming unstable. Stop him before it’s too late! He’s protected by a group of vicious beasts that will require the plasma bow and eagle animal power to defeat. Good luck! Features separating plasma bow and shoulder-mounted wings! Furno’s specialties are scouting and powered flight! Includes bright yellow hero core on chest! Stands over 6” (17cm) tall! A photograph of the Furno+Bulk combiner set. Facts about "2191 Furno 3.0"